Amelia Earhart became the first female pilot to fly solo across the Atlantic Ocean when she flew from Newfoundland to Ireland in 1932. In January 1935 she became the first person to fly solo across the Pacific Ocean from Honolulu, Hawaii to Oakland, California. 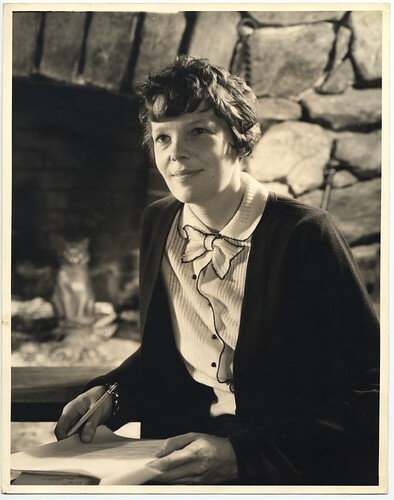 Earhart set several other aviation records and was awarded the U.S. Distinguished Flying Cross. Amelia Mary Earhart was born was born in Atchison, Kansas in July 1897. On a visit to and airfield in Long Beach, California on December 28th 1920 she took her first flight. She later said: ‘By the time I had got two or three hundred feet off the ground I knew I had to fly’. She took flying lessons and on May 15th 1923 she was issued with a pilot’s licence by the Fédération Aéronautique Internationale. During the early decades of the 19th century there was a fascination with aviation. Several aviators, including Earhart, set new records and many lost their lives in the process. Crossing the Atlantic Ocean had been undertaken by several aviators. On June 15th 1919 John Alcock and Arthur Whitten Brown landed their aircraft near Clifden, Connemara, Co Galway. They were the first people to fly across the Atlantic Ocean non-stop, having taken off from St John’s Newfoundland 16 hours earlier. On April 16th 1927 José Manuel Sarmento de Beires, who was a Portuguese army officer and aviator, flew from Portuguese Guinea (now Guinea-Bissau) on the West coast of Africa to Brazil. He had named his plane ‘The Argos’. It was the first night-time flight across the Atlantic and took just over 18 hours. Just over a month later on May 20th 1927, American aviator Charles Lindbergh flew non-stop from Roosevelt Field in New York in ‘The Spirit of St Louis’ to Le Bourget Airport near Paris. It was the first solo crossing of the Atlantic from America to Continental Europe. The flight, which encountered many difficulties took over 33 hours. All the non-stop flights across the north Atlantic had been from West to East. It was not until 1928 that the first successful non-stop transatlantic flight from East-to-West took place. The flight was in an aeroplane called, ‘The Bremen’, which took off from Baldonnel Airfield, Dublin on April 12th 1928. It had a crew of three made up of: pilot Captain Hermann Köhl from Germany, navigator Major James Fitzmaurice of the Irish Air Corps, and Ehrenfried Günther Freiherr von Hünefeld from Germany who was the owner of the aircraft. They landed on Greenly Island, Canada after a flight lasting 36 hours. In 1932 Amelia Earhart set out to recreate the flight of ‘The Spirit of St Louis’. She took off from Harbour Grace, Newfoundland on May 20th 1932. 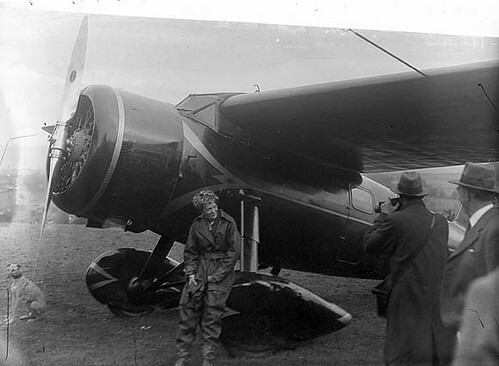 After a flight lasting almost 15 hours, during which she encountered poor weather conditions and mechanical problems, Earhart landed in a field at Culmore, north of Derry City, Northern Ireland. Her landing was witnessed by Dan McCallion who is reported to have crossed himself as the plane came to a halt. In 1937, while attempting to circumnavigate the earth, Amelia Earhart disappeared near Howland Island over the central Pacific Ocean. Amelia Earhart, American aviation pioneer, was born in born in Atchison, Kansas, USA in the year 1897 On This Day.